MIAMI, FL—Mindy Solomon Gallery presents Schemes by Ernesto Garcia Sanchez. An opening reception with the artists will take place Saturday, September 24th, from 7-9pm. The exhibition will remain on view through October 22nd. Mindy Solomon Gallery is located at 8397 NE 2nd Avenue, Miami, in Little River. Ernesto Garcia Sanchez’s paintings bring new life and energy to traditional media. Exploration, investigation, and spontaneity are the hallmarks of their individual practices. In Schemes, his second exhibition at Mindy Solomon Gallery, Ernesto Garcia Sanchez continues to explore the possibilities of line and textured surface. Born in 1989, this young artist has already experienced significant professional accomplishments. Erne, as he prefers to be called, studied at the San Alejandro Academia de Bellas Artes and continued on to graduate from the Instituto Superior de Arte in 2015. Sanchez was among the artists chosen to present work in the 2015 Havana Biennial—the first since US restoration of diplomatic relations with Cuba. The projects included in the Biennial were chosen for their potential to have an effect on Havana’s citizens, either through the participation in the work or through the presentation of the work as a live social laboratory. Ernesto’s work is deeply embedded in the painterly process, particularly the level of conscious control an artist has over the final outcome. His materials take the shape of tube like objects punctured with various holes to hold brushes and pencils. 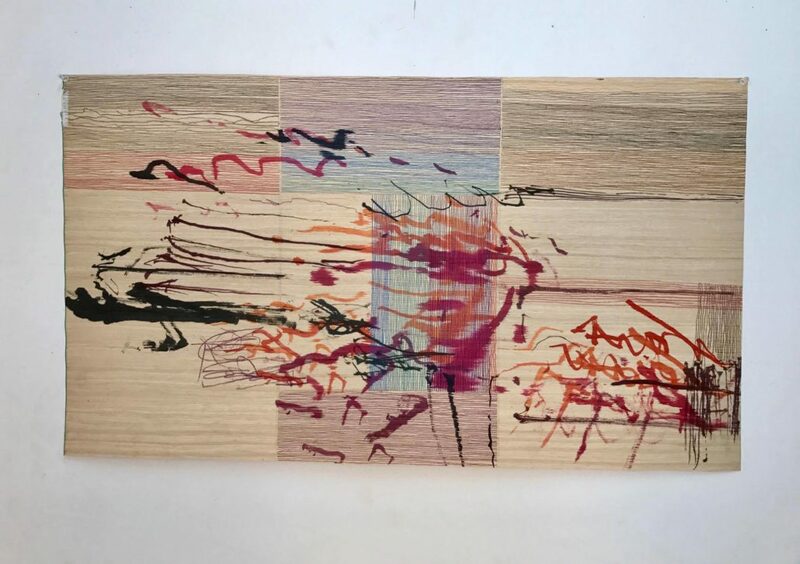 The artist’s work takes on a performative angle; through the process of controlling his drawing and painting using one side of his device, in this way he allows the other side to move freely, reflecting the subconscious act of painting. The results are aesthetically beautiful and theoretically fascinating. The artist has recently moved to working on veneer, allowing the natural lines of wood to condition the movement of his homemade devices. Ernesto Garcia Sanchez Born in 1989 in Havana, Cuba, Sanchez self-taught disciplines from drawing and painting to sculpture after graduating high school, preparing to enter the San Alejandro Academy of Fine Arts. After earning his BFA, Sanchez also served at the academy as an assistant professor. He is currently completing his fifth year as visual arts faculty in the painting specialty at Superior Institute of Fine Arts (ISA), in Havana and has participated in group exhibitions and solo shows in Cuba, the US, Asia, Europe, and South America.